No matter what work you do, you always need customers. More customers = more sales = more profit = Happy You. I use Tweet Attacks Pro along with a little help from ScrapeBox to reach to my targeted audience (potential customers) on Twitter. In this post I will show you how you can reach to your target audience & can generate leads for your business using Tweet Attacks Pro. 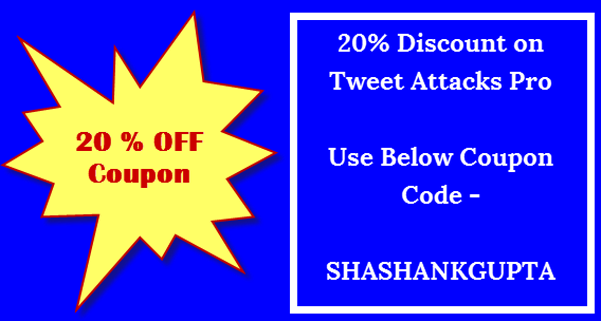 If you have not checked my Tweet Attacks Pro video tutorials, check them now and become pro. 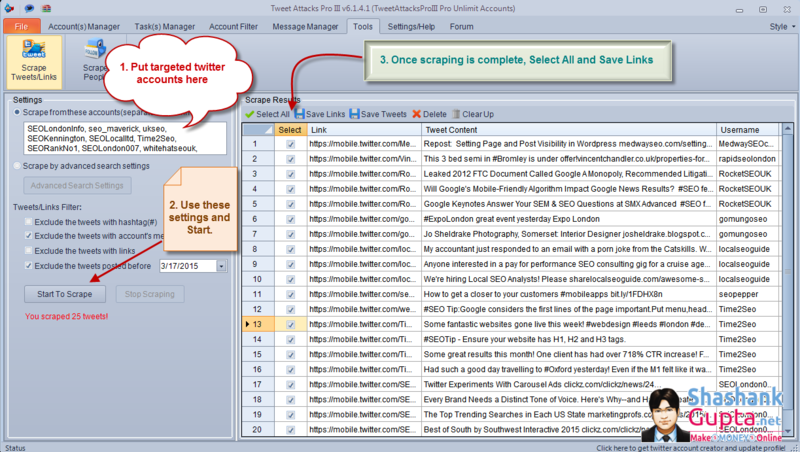 For those of you who have never used Tweet Attacks Pro 3, it is a fantastic twitter automation tool. By automation I don't mean any black hat techniques, I am simply referring to freeing your time from the repetitive task that a software can do for you. Using this tool, you can reach thousands of your targeted audience within no time. 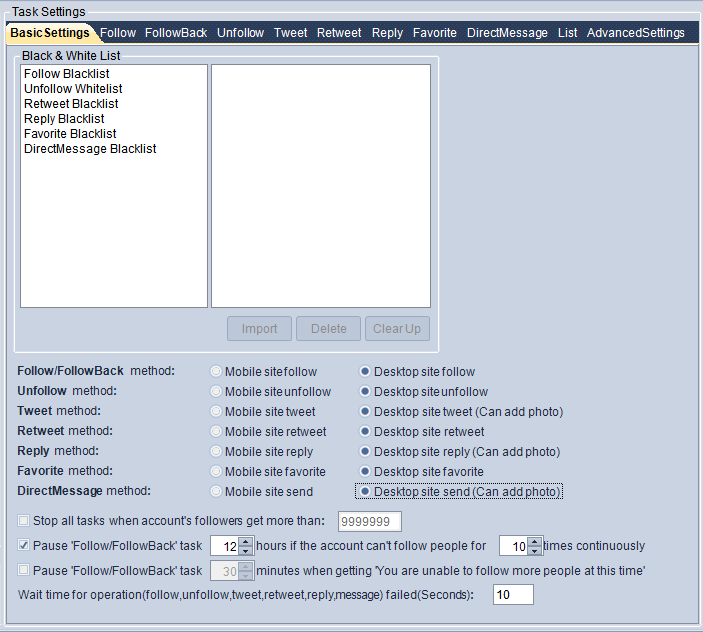 What is TweetAttackPro 3 & Why to use it? Apart from managing this blog; I also provide SEO Services and as with any business I am always on lookout for ways to generate more business, reach out to more customers, and generate more leads. In my industry, Twitter is a tool used by most of target audience. Hence I wanted to exploit its potential to reach out to my audience. Unlike most automation tools, it does not use API and logs in manually, thus increasing its success percentage with Twitter vastly. Tweet Attacks Pro 3 offers host of features, the list is mind boggling. You get regular stuff like tweet, retweet, follow, unfollow etc, plus it offers inbuilt scraping functionality allowing you to scrape, followers, following, tweets and much more. 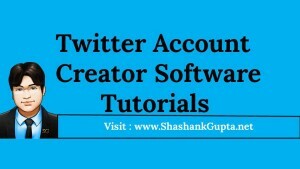 You can run unlimited accounts, do image tweets and much more. Once I got my hands on this tool, I explored it, created a strategy to use it to reach my audience, tested, reworked my strategy and finally found a successful strategy for reaching out to my audience and getting more business from Twitter. 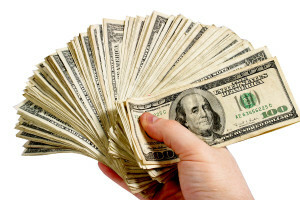 Lets look how you too can replicate my strategy and get more leads from Twitter, using TweetAttacksPro 3 for your business. Research to Identify: This is very important prelude to using any tool or technique successfully. You know your business best, and its important you research and define your niche, its nuances and your goals clearly. This will help you make the implementation stage very smooth and hassle free. Use tools like Klout, Peer Index, FollowerWonk, BuzzSumo etc to identify the key twitter influencers in your niche. These influencers are the people you will be looking to follow and monitor on regular basis. While these people are not your target audience they can influence your target audience to bring business to you. Our aim is to closely follow these influencers, interact with them via retweets and reply to their tweets with the objective to gain exposure on their Twitter stream. Discover the keywords which your target audience is using to sell their services eg. SEO London, Local SEO Kent, Website designing. Now use the above collected keywords to determine their related #tags. add these #tags in a separate excel file and name it “hastags.txt”. As you can see above in screenshot 1; I have harvested business websites who is my target audience. Now i need to find their Twitter account to connect with them on Twitter and engage with them in some conversation. This technique can be very effective, if used systematically as it allows you to reach out to your targeted audience. To find twitter accounts from these harvested urls I use Scrapebox addon called “ScrapeBox Link Extractor” with the help of this tool I will get large number of targeted twitter accounts. You can see the below screenshot 2, as to how I use this addon – You need to keep in mind that that we only need Twitter accounts. To ensure this you need to define in settings ‘ Remove urls not containing' Twitter. This way you will only have Twitter urls at the end in the report. In above screenshot, you can see numbers 0,1,2 mentioned under the heading ‘External'. 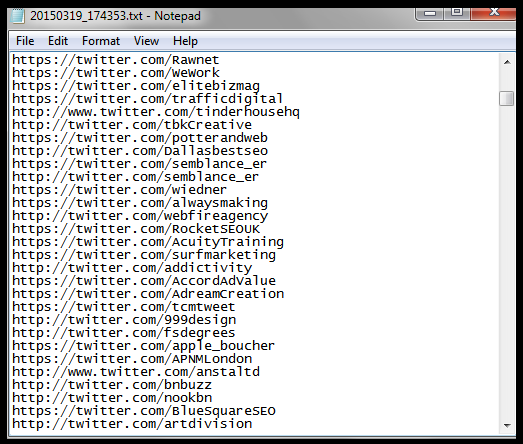 This shows how many twitter urls were found on a particular page, now lets open and see what we got in the external link file. Wow ! so I managed to get almost 800 targeted Twitter accounts, now all i need to do is, put them in Tweet Attacks Pro 3; follow all of them and grab their attention. 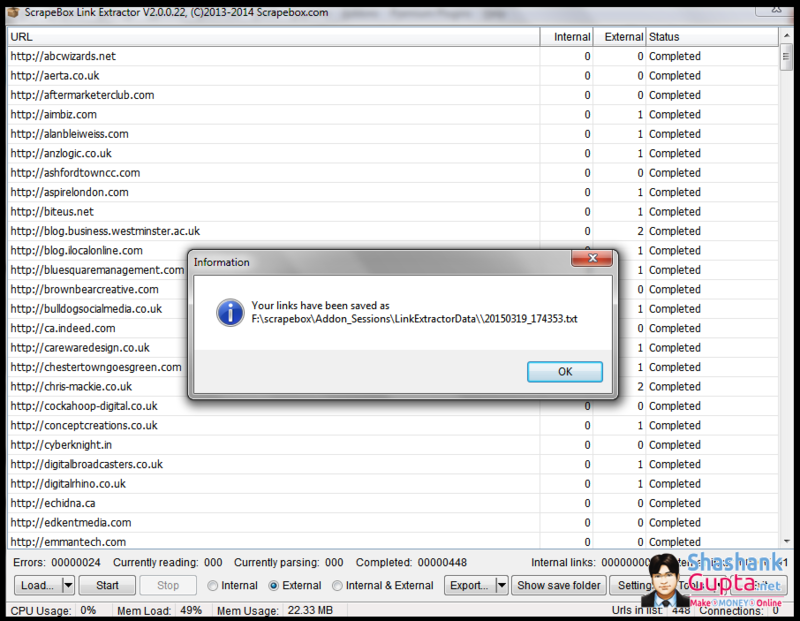 Tweet Attacks Pro is a simple to setup tool. However keep in mind that every automation tool should be used responsibly. Start slow, build on your momentum slowly. Do Not go all out with guns blazing, just because you have a automation tool. Such aggression is the leading cause of automation failure. If used properly automation tools can do wonders for you. Now lets see how to set Tweet Attacks Pro 3. 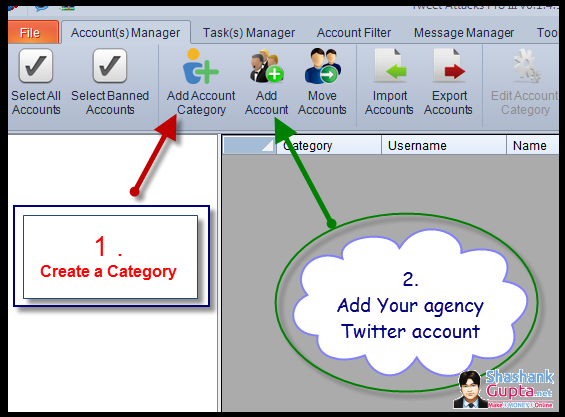 First choose a category for your twitter account and then add your Twitter account in Tweet Attacks Pro 3 as shown below. You can use the below basic settings. First thing we will set is ‘Follow' task; under this, we will follow key influencers and harvested twitter accounts. 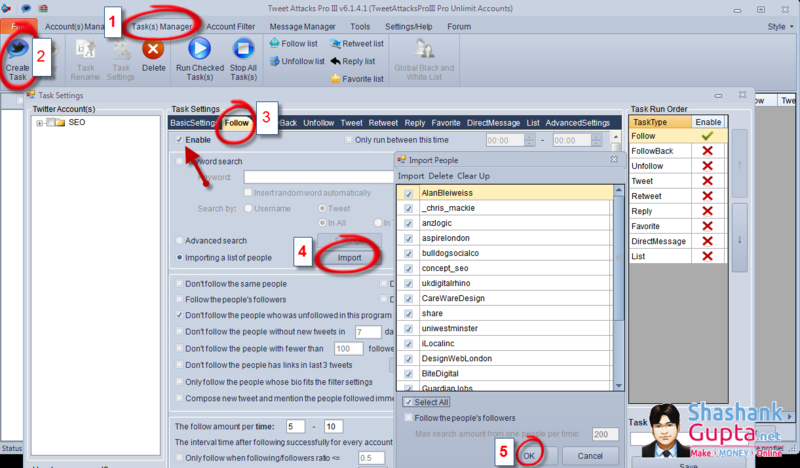 Load your files “influencers.txt” and “target audience.txt” into TweetAttacksPro 3, and optimize the settings as required. Please check the below image explaining the same. You can use below settings which I have mentioned or you can change it to more aggressive. I prefer going slow in start to make sure all processes are working fine; also you need to optimize your settings as you move on. Below are the setting you can use for auto tweet, as you go on, keep tweaking these setting based on how aggressive you want to be. Lets grab some attention of target audience by re-tweeting what they have tweeted; this will give you a chance to get noticed by your target audience, and influencers. 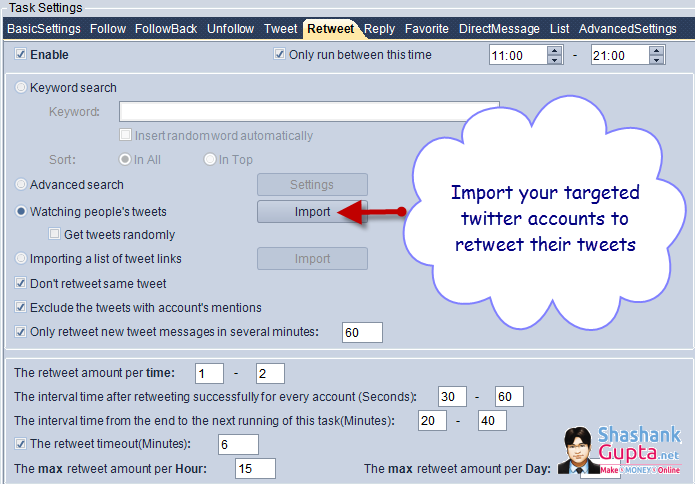 Import your targeted twitter accounts and you can use below setting to set up retweet. 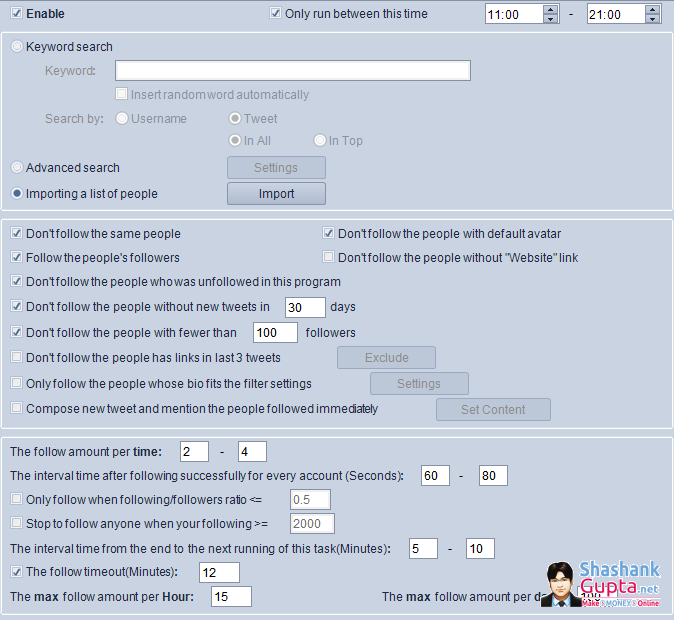 Tweet Attacks Pro 3 has inbuilt tool to scrape Tweets/Links and scrape people's followers & followings. This is a fantastic tool and i really like it. Using this tool we will scrape tweets of our ‘target audience' and ‘influencers' and then favorite these tweets. For scraping links from this tool, you can use below shown settings and find twitter links to favorite. I have saved this link list and will use it under auto favorite section. 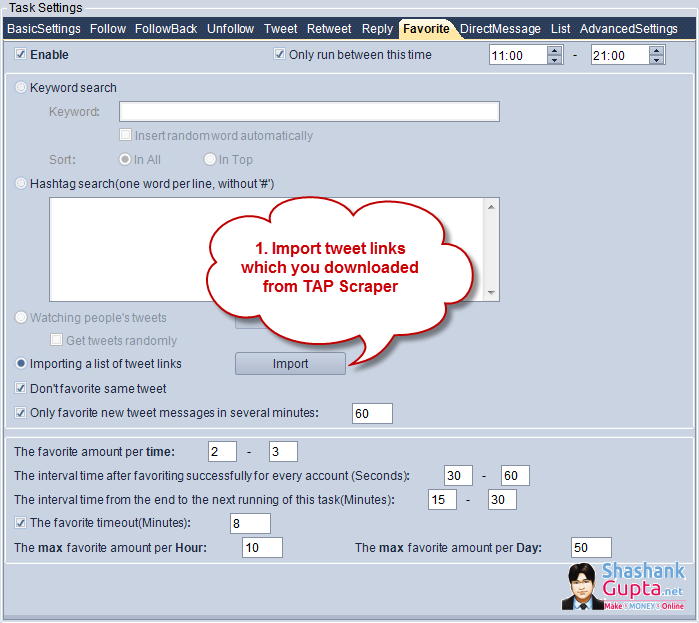 Once you have saved link list from TweetAttacksPro 3 scraper, upload it as shown below. You can use my settings or you can chose of your own. 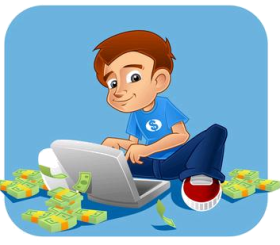 At times you will find that your account is not able to perform, due to myriad reasons. For these tough times we have ‘Task settings'. I use advance settings to tell TAP 3 how to enhance performance in case of failure. These settings help my account to perform better. You can use the same settings. Now its all set to go, hit the save button and run the task! Now that we have set-up As Tweet Attacks Pro 3 and have it running, your account is ready for use. Now comes the most important part of reaching out to your audience and offering them your services. On your website or blog create a dedicated landing page for your Twitter audience, where you will direct them to know more about your business or service. Make sure to invest enough time and vision in creating this page. Twitter offers only 140 characters to interact with your audience. Hence you may not be able to put through your entire sales pitch via tweets alone. You need to design a landing page that takes your sales pitch ahead, and ensures that your audience converts into clients. 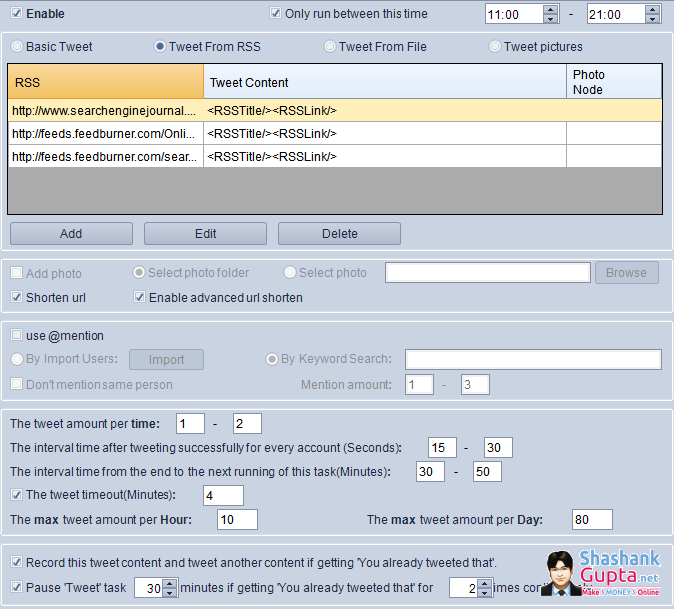 Create tweets to load into TweetAttackPro 3, which you can then set to auto tweet at specified interval. These tweets will target your audience, and talk about your service, how you can help your audience, and whats your USP. Make sure the tweets are worded well, and do not sound like your own advertisement. Everybody likes to know what you can do for them, how you can help them, so design your tweets to talk to your audience's needs. 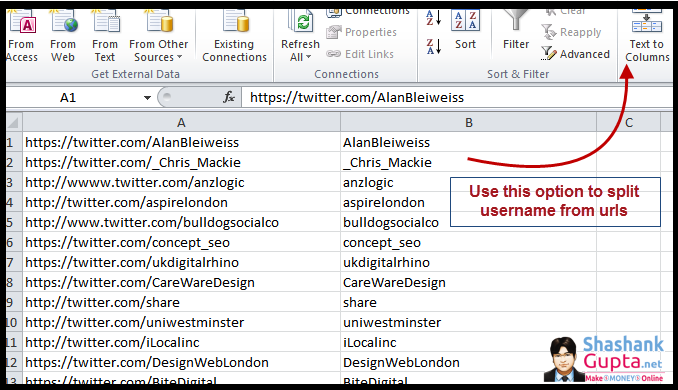 Open the files “hastags.txt” and “keywords.txt”, copy their content onto a excel sheet in two different columns. Create your tweets in the 3rd column and make sure that you incorporate relevant keywords and #hashtags into your tweets. Do not go overboard with #hashtags, too many will eat into your tweet content and make your tweet look spammy as well. For every product/ service you offer create 3/5 different tweets, incorporating different keywords and #hashtags. 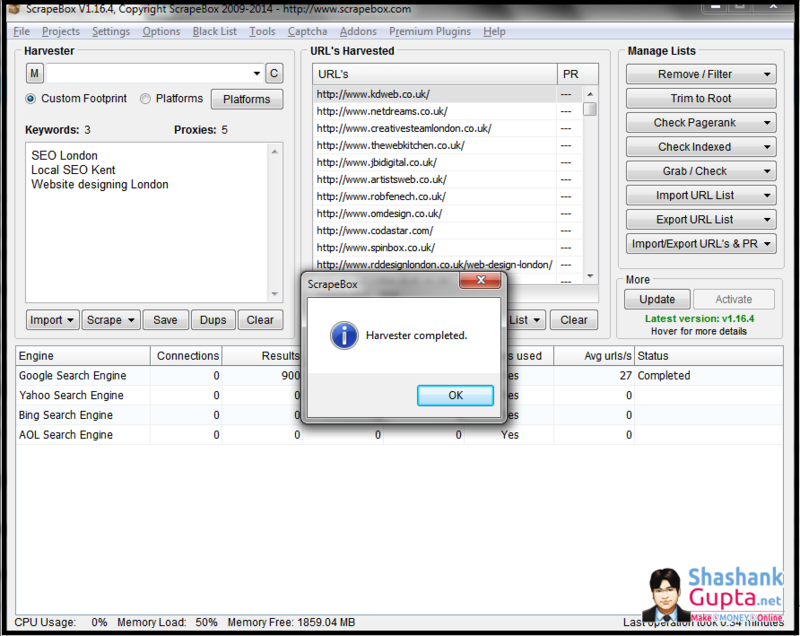 Use professional link shortner service like bit.ly to shorten your urls. Shortening allows more space for your content in the tweet and also help you monitor how your audience is interacting with your links. Integrate tweets from the leading news sources in your niche, in your twitter stream. For this you will need to locate the most popular news sources in your niche, make sure you follow them. You should retweet them whenever they mention anything that would be relevant to your audience. This will make your Twitter stream enriching for your audience, and they are more likely to interact with you and follow you. Twitter is a social forum, so make sure to do social conversations regularly. Reply to tweet by influencers in your niche, this will improve your chances of being noticed by the influencers, and getting a mention on their Twitter stream. And lets not forget your audience, make sure to follow them and reply and interact with their tweets. If you only focus on selling yourself, your customers are audience is most likely to ignore you. You need to integrate yourself with your audience, talk to them on their topics. TweetAttacksPro 3 is a awesome automation tool, and if used in the right manner it can make your Twitter account your best friend by generating substantial leads for you. To succeed it is essential that you use automation judiciously. While Tweet Attacks Pro 3 is automating things for you; make sure you keep a track of what is happening in your account yourself as well. Periodically go beyond automation and look into things personally. Whenever your any action generates a reply from a fellow ‘Tweeple', make sure to interact manually with him/her. This will allow you to lend personal touch to your automation, and keep a tab on things as well. This is just one way of using Tweet Attacks Pro 3. Do share your thought on this post and how you use Tweet Attacks Pro 3 for your business. Visit Business Networking in Herefordshire. A weekly networking chat for small businesses in and around the Marches area. Join them every Wednesday, from 1-2pm. Use the hashtag #MarchesHour if you want them to re-tweet your message.